Probably the best preserved mining remains are at Magpie Mine, a short distance south of Sheldon in the Derbyshire Peak District. You can see the site from a distance with the remains of the ruined Cornish Engine House, sadly ruined, dating from 1869, standing high above the surrounding fields. The surface remains at Magpie Mine are probably the best example in the UK of a 19th. century lead mine. It has a fascinating history spanning more than 200 years of bonanzas and failures, of bitter disputes and fights resulting in the "murder" of three miners, and a Widows' Curse that is said to remain to this day. 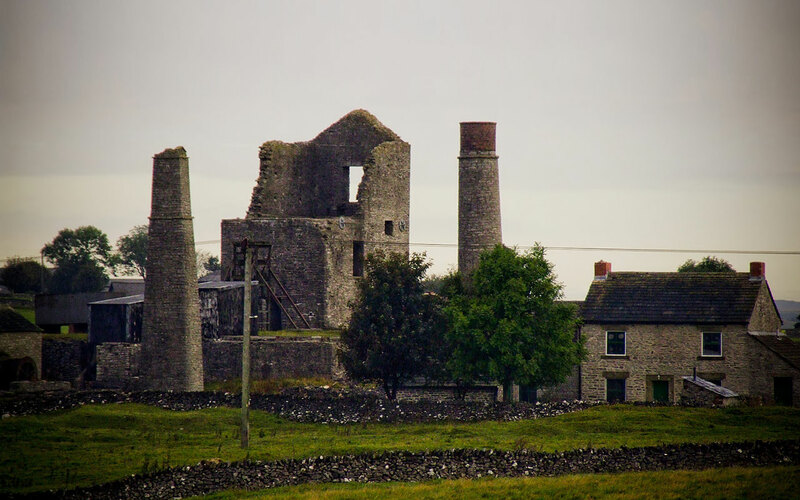 Magpie Mine had a long history, ending with the erection of a steam pumping engine to deal with the problems of water at depth. The engine had a cylinder diameter of 70 inches (1.75 m diameter). This worked at first with 850 tons of ore being raised in 1871 but the success was short lived: the engine was unable to cope with the increasing quantity of water found as the mine was driven deeper. A sough or drainage level was therefore constructed from the south bank of the River Wye. This was a huge undertaking, commenced in 1873 it was not completed until 1881 at a cost variously reported as between £14,000 and £35,000. The sough trail can be visited by following the footpath from Kirk Dale along the south bank of the River Wye for about half a mile. The earliest recorded workings date from 1740, and the Magpie Mine was one of several such ventures working different veins in the same area. Right from the start, the miners had difficulty in keeping the workings free from water, but by 1824, a Newcomen type pumping engine had been erected on the Main Shaft. This led to the production of 800 tons of lead being mined in 1827, a record that remained unbroken until 1871. Magpie Mine was also troubled by disputes with neighbouring mines over who had the right to work each vein. Miners from Magpie Mine and Maypitt Mine were both working the Great Redsoil Vein, and would light fires underground to smoke out their opponents. The arguments raged for years, both underground and in the courts. In 1833, three Maypitt miners were suffocated by the fumes, and 24 Magpie miners were put on trial for their murder. Following a year in prison and a lengthy court case at Derby Assizes, five Magpie miners were acquitted of the charge of murder owing to conflicting evidence and the lack of intent. The three widows of the Red Soil miners reputedly put a curse on the mine and supposedly a ghost was seen there in 1946. Several were freed immediately, and eventually all were acquitted because of the difficulty in identifying the individual culprits, and the provocative actions of the Maypitt miners themselves. It is said that the wives of the "murdered" men put a curse on the mine, and the effect of the disputes was to ruin the mine, which closed in 1835. In 1839, John Taylor, the famous Cornish mining engineer was brought in to re-open the Magpie Mine, which now incorporated the Great Redsoil workings. He introduced a number of innovations, including steel borers, safety hats, safety fuse, and iron winding ropes. He also introduced a more regular pattern of shift working and payment for his workers, some of whom had come up from Cornwall with him. He deepened the Main Shaft to 208 metres, and also installed a 40-inch Cornish pumping engine. When this proved inadequate, he proposed to replace it with a 70-inch engine, but the proprietors could not agree. Some felt that a sough (a drainage tunnel) would be a better solution, and appeals to the Duke of Devonshire to adjudicate fell on deaf ears. In 1842, there were two deaths at the Magpie Mine and during the next 50 years the mine was dogged by problems caused by flooding and fire. In 1880, the company operating the mine even changed its name to the Magpie Mining Company, probably in the hope of ridding itself of the curse. Various attempts were made over the next 30 years, but it was not until 1873 that construction of the sough started. It took eight years to drive from the River Wye near Ashford-in-the-Water to meet the Main Shaft, a distance of 2km. This was a huge undertaking, commenced in 1873 it was not completed until 1881 at a cost variously reported as between £14,000 and £35,000. Production of lead continued on and off into the 20th. Century. An optimistic report in 1913 promised reserves of four million tons, which attracted businessmen from Sheffield and Glasgow to join forces with Edgar Garlick, the owner. Their venture closed in 1919, and although Garlick re-opened the mine in 1923, he went into liquidation the following year. Nothing happened until after the Second World War, when Waihi Investment and Development Ltd attempted to work the mine using submersible electric pumps. A new winder - in reality a ship's winch fitted with a diesel engine - and a steel headgear were installed. Despite this more sophisticated equipment, no large body of ore was found, and with the end of the Korean War and the fall in the price of imported lead, the mine closed for the last time in 1954. After a period of inactivity several attempts were made to revive the mine, the last in the1950s. However, in 1958, the constant battle with flooding and falling prices forced the closure of the mine. It is now scheduled as an ancient monument, and is the most complete example of a lead mine remaining in the Peak District. Every era of working has left its mark on the Magpie Mine site. The adjacent circular chimney was built in 1840 to serve an earlier engine, but then re-used. The same has happened elsewhere on the site: the square chimney was also built in 1840 to serve a winding engine of which all trace has now disappeared. A flue was built to connect the chimney to the 1869 horizontal winding engine, easily identified by the winding drum on the outside of the engine house. Just in front of the Cornish Engine House is the Main Shaft, marked by the steel headgear and cage dating from the 1950's operation. The corrugated iron shed housed the winder and has the distinction of being one of only three corrugated iron buildings in the country to be accorded Scheduled Monument status. North of the Cornish Engine House is the circular powder house (1840), whilst to the east a replica horse gin has been erected on the Redsoil Engine Shaft. Another gin circle can be found at the western extremity of the site, serving the original Shuttlebark Engine Shaft (1760). There are numerous shafts on the site: all have been capped, and there is no access underground. However, on a bright day it is possible to look through the grille on the Main Shaft and see the water 175m below. The shaft is flooded for a further 47m. The Agent's House and adjacent Smithy were built in the 1840's. They have recently been renovated, and are used as the Field Centre of the Peak District Mines Historical Society. How to get there :Magpie Mine is about 5km west of Bakewell, at Grid Ref. SK173682. The access track is a private road, and cars must be parked at the roadside. Several public footpaths cross the site, allowing access on foot from Kirkdale, Sheldon village, and Hard Rake. There are no restrictions on opening times. The mouth of the Sough is on the south bank of the River Wye at SK180698, about 1.5km west of Ashford-in-the-Water. Park in the lay-by on the A6 and use the path over the river at the side of Shacklow Mill, or follow the path alongside the river from the bottom of Kirkdale. By Road: take the Monyash road out of Bakewell and after about 3 km turn right on a minor road to Chelmorton. The mine buildings can be seen on the right after about 2km.